The 'relational turn' is a movement affecting a range of disciplines including neuroscience, psychoanalysis, psychotherapy, organisational consulting and, more recently, coaching. Its primary focus is on the centrality of human relating in determining how individuals develop, make meaning and function individually and collectively. 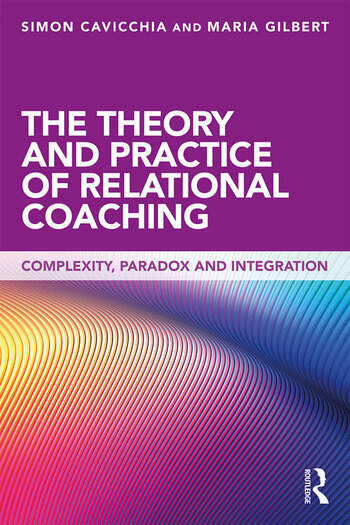 In The Theory and Practice of Relational Coaching: Complexity, Paradox and Integration, Simon Cavicchia and Maria Gilbert expand existing coaching theory and practice to focus on the implications of the relational turn for how coaches and clients think about the nature of identity, the self, change, learning, and individual and organisational development. Drawing on perspectives as varied as relational neuroscience, the relational foundations of personality development, psychoanalysis, psychotherapy, shame, vulnerability, complexity and systems ideas, the authors shed light on many of the paradoxes and challenges facing coaches and their clients in today’s fast-paced, volatile and uncertain organisational environments. These include holding tensions such as the uniqueness of individual needs with the requirements of organisational contexts, managing multiple stakeholder expectations and networks and balancing linear approaches to change with adjusting to emerging and unpredictable events. Given the ever-increasing volatility, complexity and uncertainty that coaches and their clients face, The Theory and Practice of Relational Coaching guides the reader through a series of illuminating perspectives, examples and practical suggestions. These will enable coaches to integrate a more relational orientation in their work and extend their range and that of their clients for responding creatively to the challenges of modern organisational life. The book will appeal to coaches and coaching psychologists in practice and training, as well as counsellors and psychotherapists retraining as coaches. 2 Who is it who is in a coaching relationship? Simon Cavicchia is an executive coach, a UKCP registered Gestalt psychotherapist, consultant and supervisor. He was Joint Programme Leader of the MSc in Coaching Psychology at the Metanoia Institute in London for eight years. He divides his time between executive coaching, consulting and teaching on postgraduate programmes in coaching and organisational development. He is currently on the faculty of the Ashridge Masters in Executive Coaching. Maria Gilbert is a Chartered Clinical Psychologist, a UKCP registered Integrative psychotherapist, BACP accredited supervisor and coach. For many years, she was the Joint Head of the Integrative Department, the Supervision Training and the MSc in Coaching Psychology at the Metanoia Institute in London, and a Visiting Professor at Middlesex University.